Yes, that’s right. DEEP-FRIED SOUP. 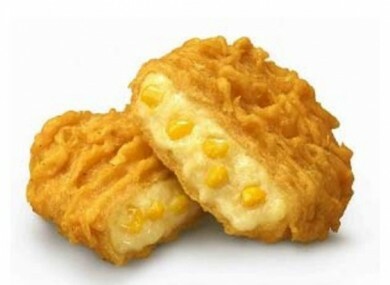 AS OF TOMORROW, KFC will be selling deep fried soup to its customers in Japan. We’re just going to leave that there for a second so you can ruminate on it. Apparently a creamy soup called corn potage has become a real hit in Japan of late, so restaurants are scurrying to piggy back on the trend. What could KFC do to make it special? Deep-fry it, of course! Of course. Of course they do. Apparently what you end up with is something crispy on the outside but soft and creamy on the inside. Oh God. Now we want one. Alas, it will only be available in Japan, and only for a short time. Email “Deep-fried soup is the latest food fad”. Feedback on “Deep-fried soup is the latest food fad”.